The scene inside the vehicle, where a passenger is trapped, at bstreetsmart 2017. Below is what you will hear at bstreetsmart – an event that could go by the bland description of ‘road safety program’ but is so, so much more. You’ll hear 26,000 kids goofing around with their mates, snapping selfies and talking through road safety ads playing on giant screens above them. You’ll hear whoops of approval for NSW Premier Gladys Berejiklian and a kind of ambivalent applause for almost everyone else. As the lights go down, you’ll hear squealing tyres, mashing metal and a loud bang. And then you’ll hear 26,000 students stunned into silence as the lights come up to reveal a motorbike that has spun out from under its moaning driver, a deep gash in his leg; a crying girl, trapped and bloody in the front seat of a small silver car; a driver uninjured and in shock, asking panicked questions and willing everyone to be okay. And you’ll see one motionless body on the concrete, blood pooling gently around it. Her name, in this simulation, is Grace. She has been thrown through the windscreen of the car and killed. There were 384 people killed on NSW Roads in 2016, up 34 from 2015. The number of P-plate drivers killed, and the number of fatalities involving P-plate drivers, also increased. Deaths in the 17-25 age group increased significantly. P-platers make up eight per cent of all driver licence holders, yet their crashes account for 15 per cent of all fatalities on NSW roads. Actor Jessica Lawrence, who played the deceased passenger Grace in the 2017 bstreetsmart simulation. 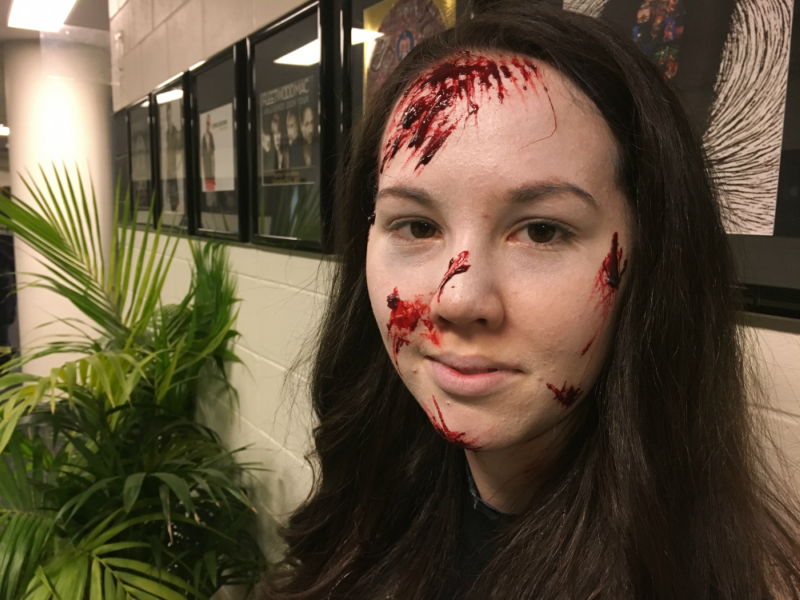 Bstreetsmart is aimed at bringing those numbers down by bringing year 11 and 12 students up close and personal with the confronting reality of an accident. In this case, the young driver has been drinking – not heavily, but drinking nonetheless. Grace has taken off her seatbelt. She’s shown the driver a picture on her phone, distracting him from the road. Her friend is now trapped and bleeding, pleading for help. Over an hour or so, students see the grim reality of an accident: a P-plater first on the scene, police, ambulance and fire and rescue arriving one by one, some bracing the the girl in the car into position to prevent further injuries, others helping the biker, others covering Grace’s body with a sheet that will soon be stained red with blood. They will hear the hydraulics behind the jaws of life as they cut through the side of the car. “See that – that’s what you did,” the actor playing the enraged P-plater yells at the driver, who still seems too shocked to take it all in. This is not a 30-second television commercial. Students are seeing how long it takes to deal with a crash scene, the care it demands, the mess and blood and emotion. Then we see what happens next. The female passenger is taken to emergency, then to intensive care, and faces a long and difficult recovery. The driver is charged with dangerous driving causing death and two counts of dangerous driving causing injury. He has returned a mid-range alcohol reading, and is charged for that as well. The court sentences him to three years in prison, and his licence is disqualified for five years. His record means there are jobs he will never be able to do. Grace’s heart has stopped beating so she can’t donate her organs. She can, however, donate tissue. Her body is taken to the mortuary and put in a cold room. Her family will see their daughter one last time – when they identify her. Tristan Kennedy and Alyssa Hartup shared their stories at bstreetsmart 2017. Both suffered serious injuries in road accidents. It’s something Tristan Kennedy knows all too well. He was riding his trail bike with his friend Dwayne when they were hit by a truck. He spent 14 months in the Westmead brain injury unit, learning to walk, eat and drink again. Dwayne was killed. Alyssa Hartup also suffered serious injuries in a car accident. “I lost a lot of friends,” she told the kids at bstreetsmart. “You find out who you true friends are. “I want to prevent anything like this happening to you guys. bstreetsmart was co-founded by Westmead trauma nurses Stephanie Wilson and Julie Seggie. More than 145,000 NSW high school students have gone through the potentially life-saving program since it began in 2005. Thousands of students from 210 schools watch the realistic simulation at bstreetsmart 2017.